Ciba Specialty Chemicals Corporation (Tarrytown, NY) developed cationic alkoxyamines as polymerization initiators/regulators in a controlled stable free radical polymerization process to produce intercalated and/or exfoliated nanoparticles from natural or synthetic clays. The process results in improved nanocomposites and nanocomposite compositions for use in paints, inks, coatings, sealants, caulks, adhesives, reactive diluents and as plastic additives and in thermoplastic materials, according to U.S. Patent 7,595,359. One way of improving polymer properties is by adding a natural or synthetic clay material to polymers to form composite materials. However, incorporating clays into polymers may not provide a desirable improvement in the physical properties, particularly mechanical and optical properties of the polymer may be adversely affected. Nanocomposite compositions containing finely dispersed natural or synthetic clay with at least partially intercalated and/or exfoliated layers and mixtures of ethylenically unsaturated monomers and/or polymers have attracted much interest in recent years. According to Ciba inventors Andreas Muhlebach, Peter Nesvadba and Andreas Kramer, nanoclay materials combine the desired effects of dispersed clay by avoiding the negative influence on the mechanical or optical properties. The nanocomposite compositions can be optically almost transparent, indicating the fine distribution, on the nanometer scale, of the clay. Ciba provides alkoxyamines, which can be anchored to natural or synthetic clays by a cationic anchor group and which have a high reactivity towards acrylates, methacrylates, styrene and other monomers resulting in a controlled molecular weight with narrow molecular weight distribution. With these compounds polymerization leads to high monomer to polymer conversions in short times and at relatively low temperatures. In contrast to conventional radical polymerization, controlled radical polymerization permits the adjustment of the molecular weight of all growing chains almost uniformly to a predetermined length (low polydispersity), resulting in an almost ideal dispersion of the intercalated and/or exfoliated clay particles. Copper-based alloys and composites are candidate materials for high heat flux structural applications because of their high thermal conductivity and high-temperature strength. Such applications include hot gas walls for combustion chambers and surfaces of nozzle ramps for rocket engines and for the next generation launch vehicles. Other applications include protective coatings for heat exchangers in commercial power generation systems and firearm barrels. A major limitation to the use of any of these copper-based materials, however, is their rapid oxidation at elevated temperatures. In addition, copper-alloy rocket engine combustion chamber linings have been found to deteriorate when exposed to cyclic reducing/oxidizing (redox) environments, which are a consequence of the combustion process. This deterioration, known as blanching, can be characterized by increased roughness and burn-through sites in the wall of the combustion chamber lining and can seriously reduce the operational lifetime of the combustion chamber. Southwest Research Institute’s coatings display excellent oxidation resistance under high temperature oxidative conditions and perform as well as coatings requiring greater layer thickness and higher levels of chromium. Catalytic Materials, LLC (Pittsboro, NC) researchers Terry K. Baker and Nelly M. Rodriguez discovered how to make multi-faceted multi-wall carbon nanotubes with crystallinities ranging from greater than about 95% to substantially 100% as well as other nanocarbon forms by controlling temperature in the presence of specific catalysts. Carbon nanostructures are generally prepared by reacting the powdered catalyst in a heating zone with the vapor of a suitable carbon-containing compound. 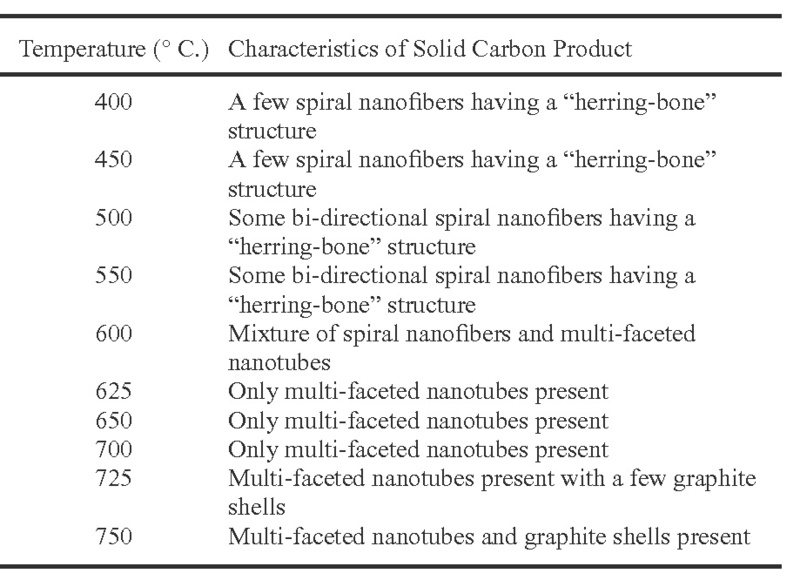 While the art teaches a wide variety of carbon-containing compounds as being suitable for the preparation of carbon nanostructures, the inventors found that only a mixture of CO and H2 will yield carbon nanofibers with unexpectedly high crystallinities and in the unique structures of nanofibers of their invention in the temperature range of about 550.degree C to about 725 degree C.
Catalysts used to prepare the carbon nanofibers are bulk metals in powder form wherein the metal is selected from the group consisting of iron, iron-copper bimetallics, iron-nickel bimetallics and also cobalt-magnesium oxide mixtures. It is well established that the ferromagnetic metals, iron, cobalt, and nickel, are active catalysts for the growth of carbon nanofibers during decomposition of certain hydrocarbons or carbon monoxide. Efforts are now being directed at modifying the catalytic behavior of these metals, with respect to nanofiber growth, by introducing other metals and non-metals into the system. In this respect, copper is an enigma, appearing to be relatively inert towards carbon deposition during the CO/H2 reaction. Thus, it is unexpected that Fe or the combination of Cu or Ni with Fe would have such a dramatic effect on carbon nanofiber growth in the CO/H2 system in the temperature range of about 550 degree C to about 725.degree C. For the cobalt-magnesium oxide system the preferred temperature range is 580 degree C. to about 600 degree C. Iron-nickel catalysts and cobalt-magnesium oxide are preferred for preparing the carbon nanostructures. 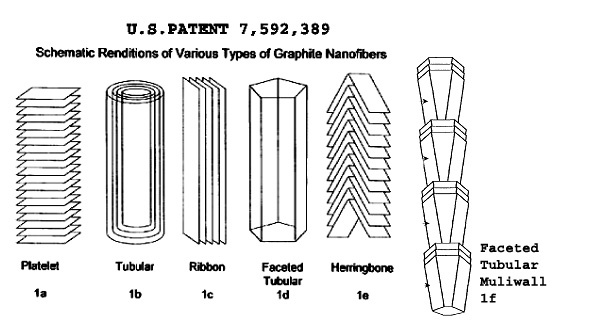 The following figure illustrates the various shapes formed by Catalytic Materials, LLC’s patented process as well as the temperatures at which certain shapes are formed as revealed in U.S. Patent 7,592,389. FIG. 1a is a representation of a platelet carbon nanofiber, which is comprised of substantially graphite sheets that are substantially perpendicular to the longitudinal axis, or growth axis, of the nanofiber. FIG. 1b is a representation of a cylindrical carbon nanostructure that is comprised of continuous carbon sheets and is in the form of tube within a tube within a tube with a substantially hollow center. FIG. 1c is a representation of a ribbon carbon nanofiber comprised of non-connected graphitic sheets that are aligned face-to-face and substantially parallel to the longitudinal axis of the nanofiber. FIG. 1d is a representation of a faceted tubular carbon nanofiber and is comprised of continuous sheets of graphic carbon but having multifaceted flat faces. 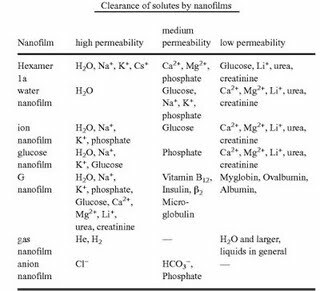 The graphitic sheets are also substantially parallel to the longitudinal axis of the nanofiber. FIG. 1e is a representation of a herringbone carbon nanofiber wherein the graphitic platelets or sheets are at an angle to the longitudinal axis of the nanofiber. The carbon nanofibers can be dispersed in a polymer by various well-known techniques such as melting and kneading to form an admixture that can be subsequently shaped to form an electrically conductive article. Multi-faceted carbon nanotubes are more conductive electrically than cylindrical carbon nanotubes. The use of conductive nanofibers is highly desirable since a given weight of such a material generates a large number of contact points within a polymer matrix. The widespread interest in electrically conductive polymers is stimulated by the possibility that such materials can have utility in such things as semiconductor chips, integrated circuits, lightweight battery components, sensors, electro-chromic displays, anti-static coatings, static dissipation, electromagnetic and radio-frequency interference shielding, fuel hoses, connectors and packaging items. It is well established that the incorporation of certain types of carbon nanofibers into polymeric materials can impart electrical conductivity to such materials that are generally regarded as insulators. University of Arkansas physicists Ivan I. Naumov, Laurent M. Bellaiche, Sergey A Prosandeev, Inna V Ponomareva and Igor A. Kornev reported in 2004 a new phase in tiny nanodisks and nanorods that potentially may enable researchers to increase memory storage by more than one thousand fold. The discovery earned U.S. Patent 7,593,250 in September 2009. The minimum size, i.e., the diameter, of the nanodisks that display bi-stable toroid moments is demonstrated to be 2.8 nanometers (nm). Using the vortex states as discovered in this invention, the ultimate storage density of this approach reaches 80 Terabits per square inch. The storage density achieved by the nanodisks far exceeds the current storage capability of 1 GBits per square inch using magnetic recording. This value is five orders of magnitude higher than that using the conventional approach by use of macroscopic polarization. The invention, assigned to the Board of Trustees of the University of Arkansas, increases the data storage capability of non-volatile ferroelectric random access memory (NFERAM) using the newly discovered multiple degenerate states formed by ordered toroid moments in low dimensional nanoscale ferroelectric structures. For instance, at low temperature, ferroelectric nanodisks of lead zirconium titanate (PZT) exhibit two robust bi-stable states with clockwise or counterclockwise concentric vortex rings, and these states with opposite toroid moments can be used as the logic states to store "0" and "1" in memory devices. This approach is drastically different from--and superior to--the conventional approach where macroscopic polarization is used. In fact, macroscopic polarization does not exist in the nanodisks and thus cannot be utilized for the purpose of memory devices. Storing data using toroid moments offers superiority over using the usual polarization in many respects. The multi-stable states of different toroid moments in researchers approach can be conveniently switched by time-dependent magnetic fields. The latter does not require electrode contact which is challenging to make in nanoscale devices. The scientists also found that the toroid moments can be switched by application of inhomogeneous electric fields. In addition to its use in NFERAMs, the discovery of ferroelectricity in nanoparticles may be used for piezoelectric sensors, efficient actuators, nano-scale dielectric capacitors for energy storage, and nano-scale ultrasounds for medical use. Ferroelectric materials possess spontaneous dipoles, or charge separations, that allow them to create the images seen in medical ultrasound and naval sonar, and also are used to convert signals to sound in cell phones and other audio devices. How these dipoles behave when the material is on the nanoscale is not well known.